Greetings Dear Reader. 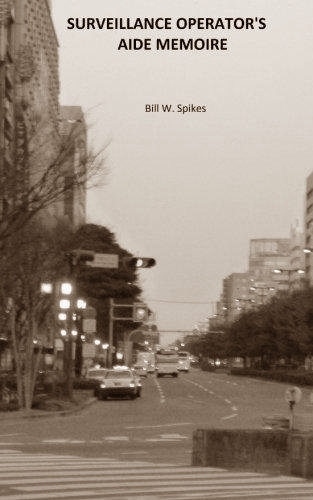 After a slight hiatus for personal reasons, I'm back with a review of the recent purchase (thanks to Pursuit Magazine for the heads-up) of the Surveillance Operator's Aide Memoire by Bill Spikes. If you don't know what an aide memoire is, you can look it up. Also, you can follow the author on Twitter. Basically, this is like the Cliff's Notes accompaniment to a surveillance operator's training course - and this is evidently one of the purposes for the book. At 133 pages in a slightly odd-sized paperback format, there isn't a lot of room to waste and, to the author's credit, waste isn't apparently in his lexicon. Each chapter deals with a specific part of a surveillance operation and broken down into various elements, each with a number of concise points to remember. It doesn't sound like much, and doesn't look like much, but believe me there is a wealth of information there, just presented in very few words. This is not a 'how to' manual. And, as should be evident from the title, it is an accompaniment to a training regime, a guide for an instructor, or a reminder to experienced surveillance operators. There is nothing negative I can say about this book. Personally, I would have preferred maybe a plain hard cover, but that's not really a criticism. Definitely an A+ as far as I'm concerned. Every surveillance operator should have a copy. Why do I always get the crazy ones?